This post was originally written April 2013, before I knew about how awful Autism $peaks is. I have chosen to leave it up rather than deleting it, because I want to show how far my own understanding has come and how we can change. Today is World Autism Awareness Day! The point is to raise awareness and understanding of autism worldwide. People wear blue clothing or change their house light bulbs blue. Cities have participated in the past with Toronto's CN Tower and New York's Empire State Building turning blue for the night. One family's way to Light It Up Blue. Also, Toys R Us Canada will donate $1 to Autism Speaks for every "like" on their Facebook page until April 30th. Are you doing anything special? Is your city? Let me know! 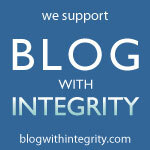 Either way, thank you for reading our blog and following this journey with us. That's the best type of awareness anyone can gain and we appreciate it.